“Rancher” redirects here. For other uses, see Rancher (disambiguation). Ranches that cater exclusively to tourists are called guest ranches or, colloquially, “dude ranches.” Most working ranches do not cater to guests, though they may allow private hunters or outfitters onto their property to hunt native wildlife. However, in recent years, a few struggling smaller operations have added some dude ranch features, such as horseback rides, cattle drives or guided hunting, in an attempt to bring in additional income. Ranching is part of the iconography of the “Wild West” as seen in Western movies and rodeos. The prairie and desert lands of what today is Mexico and the western United States were well-suited to “open range” grazing. For example, American bison had been a mainstay of the diet for the Native Americans in the Great Plains for centuries. Likewise, cattle and other livestock were simply turned loose in the spring after their young were born and allowed to roam with little supervision and no fences, then rounded up in the fall, with the mature animals driven to market and the breeding stock brought close to the ranch headquarters for greater protection in the winter. The use of livestock branding allowed the cattle owned by different ranchers to be identified and sorted. Beginning with the settlement of Texas in the 1840s, and expansion both north and west from that time, through the Civil War and into the 1880s, ranching dominated western economic activity. Along with ranchers came the need for agricultural crops to feed both humans and livestock, and hence many farmers also came west along with ranchers. Many operations were “diversified,” with both ranching and farming activities taking place. With the Homestead Act of 1862, more settlers came west to set up farms. This created some conflict, as increasing numbers of farmers needed to fence off fields to prevent cattle and sheep from eating their crops. Barbed wire, invented in 1874, gradually made inroads in fencing off privately owned land, especially for homesteads. There was some reduction of land on the Great Plains open to grazing. The end of the open range was not brought about by a reduction in land due to crop farming, but by overgrazing. Cattle stocked on the open range created a tragedy of the commons as each rancher sought increased economic benefit by grazing too many animals on public lands that “nobody” owned. However, being a non-native species, the grazing patterns of ever-increasing numbers of cattle slowly reduced the quality of the rangeland, in spite of the simultaneous massive slaughter of American bison that occurred. The winter of 1886–87 was one of the most severe on record, and livestock that were already stressed by reduced grazing died by the thousands. Many large cattle operations went bankrupt, and others suffered severe financial losses. Thus, after this time, ranchers also began to fence off their land and negotiated individual grazing leases with the American government so that they could keep better control of the pasture land available to their own animals. 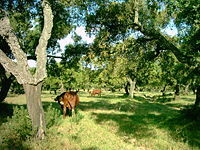 In Spain, where the origins of ranching can be traced, there are ganaderías operating on dehesa-type land, where fighting bulls are raised. However, the concept of a “ranch” is not seen to any significant degree in the rest of western Europe, where there is far less land area and sufficient rainfall allows the raising of cattle on much smaller farms. In Australia, the equivalent agricultural lands are known as ‘stations‘ in the context of what stock they carry — usually referred to as cattle stations or sheep stations. New Zealanders use the term runs and stations. The largest cattle stations in the world are located in Australia’s dry rangeland in the outback. Owners of these stations are known as ‘grazier‘, especially if they reside on the property. Employees are known as stockmen, jackaroos and ringers rather than cowboys. A number of Australian cattle stations are larger than 10,000 km2, with the greatest being Anna Creek Station which measures 23,677 km2 in area (approximately eight times the largest US Ranch). Anna Creek is owned by S Kidman & Co.
^ Haeber, Jonathan. “Vaqueros: The First Cowboys of the Open Range”. National Geographic News, August 15, 2003. Accessed online October 15, 2007.